MEGHAN: Howdy Ags! 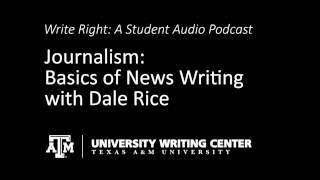 We are back today with Dale Rice, Director of Journalism Studies here at Texas A&M University. In our last episode Mr. Rice discussed journalism as a career. Today we’ll be talking with him about how to write a news story. Here’s what Mr. Rice had to say about news writing. DALE RICE: If we’re going to talk about news writing in general, the first thing that I would say about news writing is, it is a very different form of writing than a student has been used to before. If you come into my classes and you are taking the media writing course, one of the things that I’m going to force students to do is, in a sense, leave a lot of the kinds of things that they have learned at the door. And one of the best examples of that is conclusions. You know, most times when you are writing in college you are really leading toward a conclusion that you are offering. In news writing the exact opposite occurs. If you put a conclusion in there, which is opinion no matter how well supported, it will be to the detriment of your grade. Because that is one of the most important things that you end up having to learn as a journalist, is that you need to leave your bias out of the story and try and be as fair and impartial as you possibly can be. So, you think about that, and you think about well we’re dealing with a bit of a different writing style. Earlier, I alluded to that with the fact that in a news story, especially, we right with the idea with getting, in a sense, top loading the story with all of the really vital facts. And within those vital facts are those five “Ws” – the who, what, where, when, and why – and we want to get those high into any story. And then we want to expound on those with less important information as we move through the piece. Within news writing, our introduction to a story we call a lede. And in a lede we want to get the reader’s attention. We want to tell you the most important, essential, element, right there, and we want to do it relatively succinctly. We don’t want to give you 80 or 100 word summation if we can give you a 25 or 30 word summation, so the emphasis is on how well can we do it in a brief succinct way that will let you understand the very essence of what we’re going to talk about in the story. So you want a good lede put on to a story, and then within the business we have something we call the nutgraf, which is a paragraph that has all of the context of the story, that tells you the bigger picture aspect of the story, and why as a reader I should continue to read on. What is there about this subject that should make me continue to read this story? And that’s a paragraph that usually comes in somewhere between the third and sixth paragraphs of a story that kind of pulls everything together and gives the reader that necessary context. MEGHAN: And what goes in between the lede and the nutgraf? DALE RICE: Now really the lede can be followed immediately by the nutgraf, and then what you do is you have, in a sense, all of the, if you think about any good story, is going to be filled with supporting facts. And it’s going to have the quotes, for example, of people that are involved in the issue. It’s going to have other pertinent aspects that may be less important than the summation that you have in the lede, but they give you a good indication or give you additional information about what’s happening. For example, I guess one perfect local example right now: Bryan is in the search for a new police chief. At some point there’s going to be an announcement, ‘Here is the new police chief in Bryan.’ So what are you going to do in that lede? You’re going to say that the city has selected a new police chief and you’re going to give the name of that person. In the next couple of paragraphs, as supporting information for that lede, you’re going to tell who made the decision and why that happened. You’re going to move on to a nutgraf and that’s going to give you some context, so you’re going to say, ‘Well this is going to be the seventh police chief for Bryan in seven years, and the city has been looking to end a lot of turmoil and trying to do it with the selection of the new person.’ And then, for the rest of the story, you get to quote the city manager and the mayor and the new police chief and the citizens about what they think this person, the kind of job, this person will do. You get to put the background information in about the person; you’re going to tell your going to tell what background in policing is and probably some personal details about his education and his family life and where he grew up and other cities he’s worked in and those kinds of things. And then you’re going to finally wrap up with probably some of the least important information, which is again the reaction of people who are only tangentially involved and what they think about it. But that I hope gives you a little bit of an illustration of how you work through a story from the specifics, to really key elements, to less important things that are part of that. MEGHAN: Now that you have been given the structure for writing a news story, how about some practice? Sign up for Dale Rice’s Media Writing I and II classes where you will learn how to write a new story on deadline. Speaking of deadlines, in our next episode, Dale Rice will discuss the importance of being able to write on deadline. Thanks for tuning in to this episode of “Write Right” we’ll see you next time.